Meet Ugandan Kick Boxing Champion Golola Moses. Ugandan Kick Boxing Champion Golola Moses: I was tired of buying punching bags. That's why I resorted to training from forests such that I can kick trees instead. In Uganda, when you talk about Kick boxing it is sounds almost synonymous with Moses Golola. 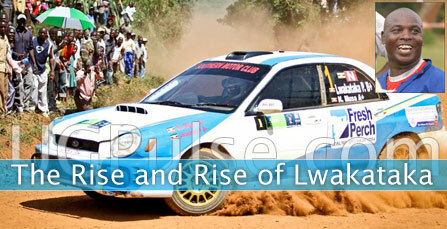 Not that he is a world champion but it’s his super natural verbose approach that has seen him dominate the headlines of both the electronic and print media of Uganda. Consequently on the streets of Kampala slogans like 'you talk as if you are related to Moses Golala' are common. 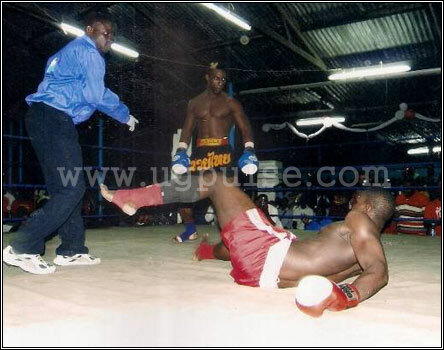 This is not to take away Golola’s credit as a really good and effective kick boxer. While he has attracted many Ugandans to the kick boxing game, it is more to do with his quotable quotes (or it is "weird" quotes) that many people want to see who this Golola is and what really can he do in the ring. Such funny utterances are common with the country’s new self proclaimed golden boy of Uganda, in addition to weird ones like hanging his clothes to dry “on electricity wires” as he claims. The flamboyant motor mouth fighter announced his presence in the sport of Kick boxing in 2005 on a sad note when he lost to Tanzania’s Joseph Kaseba in a fight organized in Zanzibar. 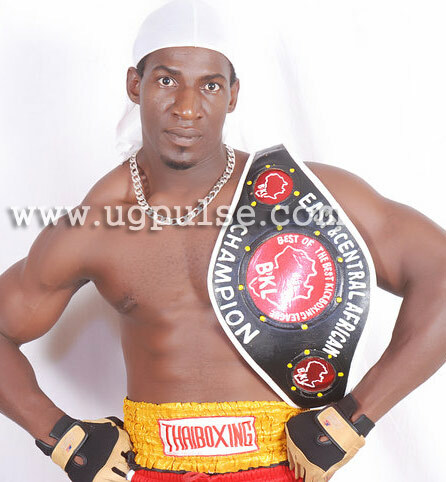 Golola says he never dreamt of becoming a kick boxer during his childhood as his interest was boxing and football. “I started as a footballer and I was a very good left winger. I used to play with the likes of Wilson Gayi (former KCC FC mid field maestro) at Kawempe Jinja -Kaloli and later on I tried boxing before joining kick boxing,” he says. He however, recalls that during child hood he could kick some of his age mates at the water spring when fetching water. “Whenever I happened to go to the well to fetch water, I could fight every one of my size,” Golola recalls. Golola however has come more to the limelight just about a month ago when he knocked out Sudanese Abdul Quadir at Hotel Africana to lift the African Middle weight belt. Prior to this fight, very few knew Moses Golola but his big mouth seem to have paid off as it hyped his fight hence a mammoth crowd. 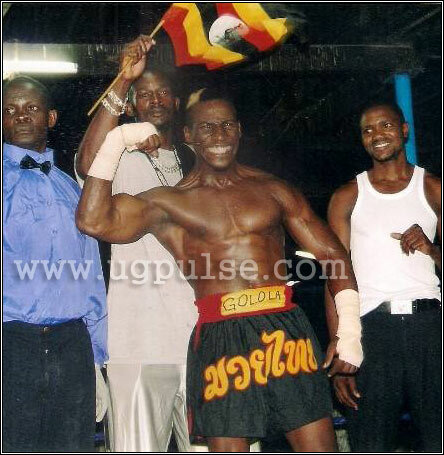 Not because Ugandans do follow kickboxing much but because they wanted to have a glimpse of at Golola whose pre – fight words over-shadowed every event in the country. As is the case for most of the sports men and ladies in Uganda and Africa in general, it hasn’t been a bed of roses for Golola as he had to maneuver through hardships to post the success he is enjoying at the moment. He says there were times he couldn’t know where his next meal could come from after running out of steam during intense training sessions. “I have endured through problems. 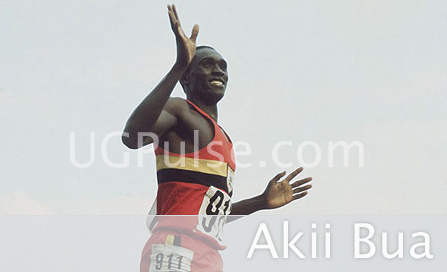 At times I could undergo a heavy training carrying empty stomach,” he narrates. Golola, born 32 years ago, was raised in a ghetto environment of Kawempe –Lugooba, a suburb of Kampala. People who stay with him say he is a reserved, humble and disciplined person as his father Daniel Ssenoga attests. “Moses is a very calm, disciplined, reserved, humble and God fearing person who never misses any church service,’’ Mzee Ssennoga says. Because of the financial constraints, Golola couldn’t go far in education. “I didn’t go beyond O- level due to financial constraints, though I was among the brightest students,” he said in an interview. Though many now know Golola for his big mouth and strange statements, no one is contesting the fact that Golola is a big talent when it comes to kick boxing. His left hook seems to be his secret weapon. In his last fight, his opponent Abdul Quardir had resisted till Golola landed his left hook and Quardir couldn’t go any extra mile. “I would be extra surprised if any fighter landed into my left hook and stayed on his feet,” Golola boasts. His coach Abdul Nasser also deserves a credit in the upward trend of his fighter. Nasser has instituted faith and a never-give-up determination in Golala despite the entire hip of hardships the sport is facing in the country. “My coach is always on my door by 5am to take me out for training. He has done much to put me into shape,” Golola says. The verbose nature of the Thai –kickboxing styled fighter, has also done good in marketing and securing sponsorship for him. Though sponsorship is still minimal, it is only a matter of time considering the fame he has gained in the country of recent. Golola uses too much energy in his fights to an extent that when he loses the target he often loses his balance. Lack of any appropriate challenge locally also remains a key issue. 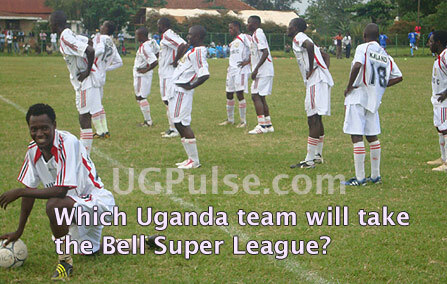 It hard to an extent that at times Golola fails to find a sparing partner. The only local kick boxer of his caliber Ssekandi Moses appears to be a nemesis. For now though, Golola is the man of the moment courtesy of his good kick boxing talent, and of course big mouth. If you think action speaks louder than words, then ask Golola. Because for him it seems action and words are all equal in achieving what he wants.